Filed a final version of the Selective Housing Agreement, signed by all members of Council of University Librarians, to the Government Publishing Office and the California State Library. Berkeley’s complete set of ERIC microfiche documents to move to NRLF to become part of the UC Federal Documents Archive. Beth Dupuis sends special thanks during this period to: Jesse Silva, Elizabeth Cowell, Dave Rez, Lynne Grigsby, Emily Stambaugh, Erik Mitchell, Colleen Carlton, Tin Tran, Andy Kohler, Charlotte Rubens, Jeff Loo, Paul Fogel, Renata Ewing, James Mabe, Glenn Gillespie, Tamara Takeshita, and the staffs at SRLF and NRLF. In December 2013 the Council of University Librarians (CoUL), with endorsement of the UC Libraries Advisory Structure Strategic Action Group 3: Collection Building & Management, charged a UC Federal Documents Archive Project Team to design and implement a virtual archive of federal government documents which includes both print and digital copies of each document owned by the UCs. Categories: Project Teams, SAG3: Collection Building & Management | Permalink. 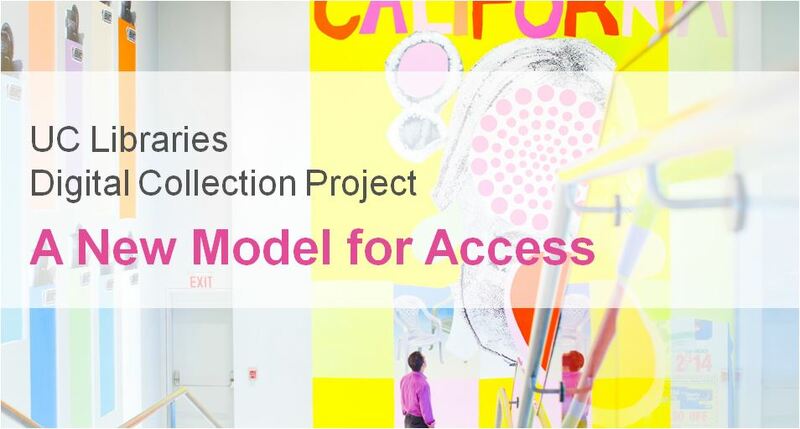 ​The UC Libraries Advisory Structure’s UCLAS Webinar Series provides an opportunity to learn more about systemwide initiatives and projects. UCLAS Coordinating Committee works in collaboration with the LAUC Executive Board to identify topics and speakers. Learn more. Each of the UC Libraries is creating and maintaining an impressive array of significant digital collections. The UC Libraries Digital Collection project (UCLDC) is a systemwide initiative to build a technical platform that will provide the libraries with more options for managing, aggregating, and sharing those collections. Sherri Berger from the CDL provided an overview of the platform and what you can expect to see when it launches this summer. The UC Libraries have digitized over 3.6 million volumes that constitute over 27% of the HathiTrust Digital Library. UC Libraries and CDL contribute at all levels in HathiTrust governance and operations. Given our collective investment in HathiTrust, how can we get the most out of this collaborative resource and its many services? Heather Christenson from the CDL provided overview of HathiTrust services, how libraries and our scholars can use HathiTrust, and some of the challenges and opportunities ahead. 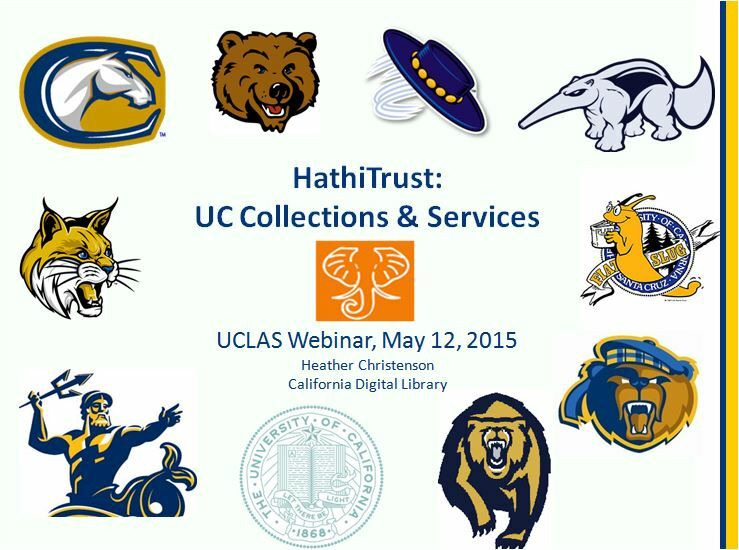 Learn more about HathiTrust and UC Mass Digitization Activities. Categories: Coordinating Committee, SAG2: Access, SAG3: Collection Building & Management, UCLAS Webinars | Permalink.